Shopping in Moscow food stores I'm having trouble with many confectionary ingredients (especially proper baking chocolate and vanilla). However and happily canned Dulce de Leche (caramelized condensed milk) is abundant and available from even the smallest and cheapest supermarket opposite your house. It comes under the label "вареная сгущенка" or "варенка", like this one in Utkonos, Moscow food delivery. It must be thanks to traditions coming from Soviet Union. I'm once again set with Lindt 70%... 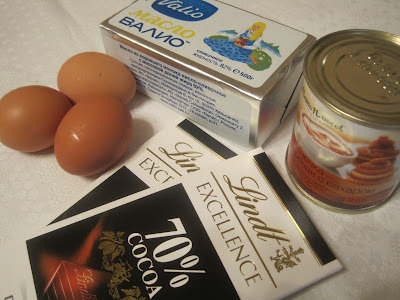 I'd really be happy if somebody knows a store in Moscow to buy proper baking chocolate, cocoa powder and liquid vanilla. The only one I've found so far is Chocolatier, however it is located really far from the center and is more for professional confectioners as it doesn't sell chocolate in less than 2.5 kg packs. Melt the butter in a medium saucepan. 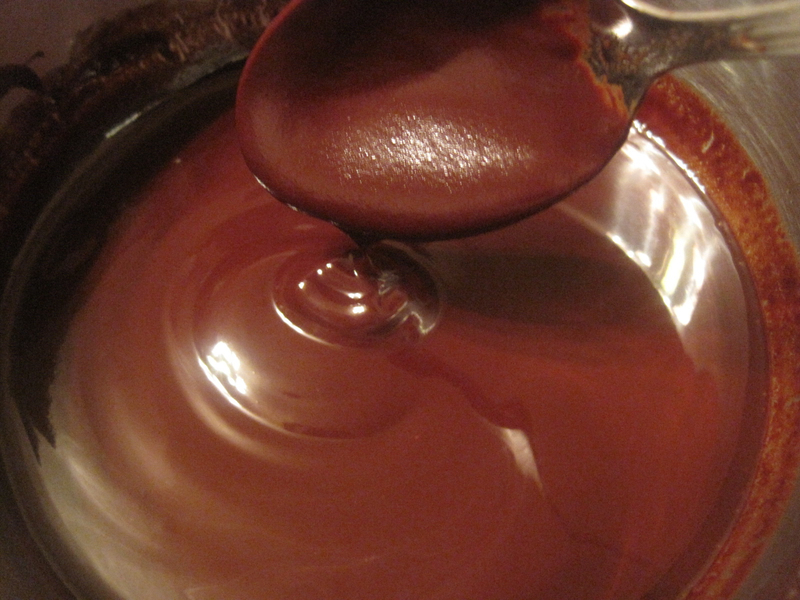 Add the chocolate pieces and stir constantly over very low heat until the chocolate is melted. The melted chocolate is so beautiful. I have to stop myself not to stir it too much. 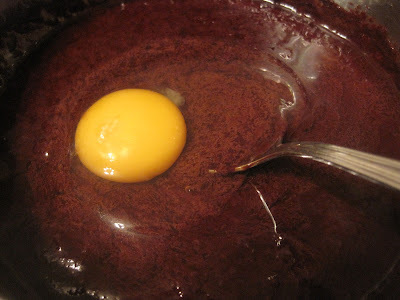 Remove from heat and whisk in the cocoa powder until smooth. Add in the eggs one at a time. 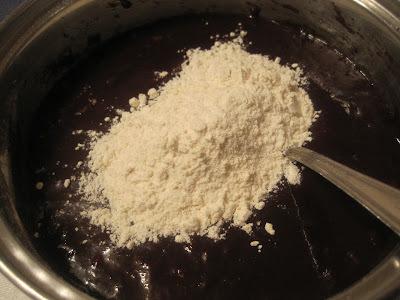 Stir in the sugar, vanilla, then the flour. Line a 8-inch (20 cm) square pan with a long sheet of aluminum foil that covers the bottom and reaches up the sides. Grease the bottom and sides of the foil with a bit of butter or non-stick spray. Scrape half of the batter into the prepared pan. 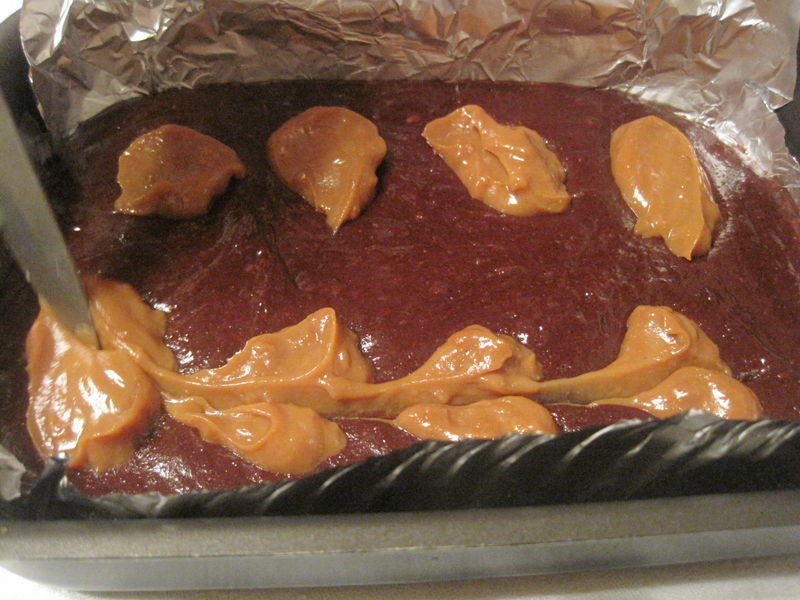 Drop one-third of the Dulce de Leche, evenly spaced, over the brownie batter, then drag a knife through to swirl it slightly. Spread the remaining brownie batter over, then drop spoonfuls of the remaining Dulce de Leche in dollops over the top of the brownie batter. Use a knife to swirl the Dulce de Leche slightly. The only thing I do differently from David Lebovitz is I set my oven at 160°C instead of 175°C and hold the brownies inside for 25 minutes instead of 35. My oven is sometimes too strong, so I have to take caution to keep the brownies soft and prevent them from over baking. The brownies are done when the center feels just-slightly firm. Remove from the oven and cool completely. The sweet and tempting chocolate smell quickly filled the house. There was no way I could 'cool them completely' as David suggested. My little brother started wondering around the oven before I even took them out. So we cut them 15 minutes after. They came out so moist and tender this time. This is fantastic! 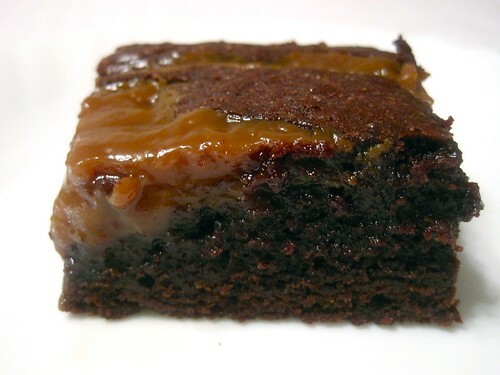 I love a moist gooey brownie. Thanks for sharing.